Corporate Social Responsibility (CSR) has increasingly been promoted as an important mechanism for furthering economic and social development goals in developing countries. In such an optimistic climate, questions arise as to whether CSR can bear the weight of the increasing expectations being heaped on its shoulders. This book examines the changing nature of corporate social responsibility as it has been conceived over the past eighty years. It considers the historical and socio-legal developments of the idea of CSR and the various conceptions of the corporation which underlie different realisations of CSR. The book explores the model of CSR deployed in the developing world as well as the links between CSR and development. 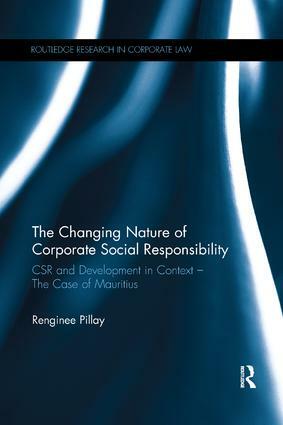 Renginee Pillay uses Mauritius as a case-study, demonstrating how CSR and corporate governance issues have come to the fore of political, financial and legal landscapes. Drawing on empirical research, the book examines how the first legislation of its kind has been implemented in Mauritius, and analyses its impact on development. In its work to evaluate the contribution CSR can make to development, this book will be of great use and interest to students and researchers of business and company law, business ethics, and development studies.